Obermeyer Kids Size Chart Obermeyer Youth Size ChartObermeyer Kids Baselayer Size Chart Keep off the cold and powder with the snowproof, insulated performance of the Obermeyer® Kids Kenzie Jacket. Regular Fit. HydroBlock® Sport shell:• Micro Twill Full Dull poly-woven shell.• HydroBlock shell provides 10k waterproof / 10k breathable protection.• Skier Critical™ seam sealing tapes strategic inner seams. EpicLoft™ insulation:• High-loft polyfill increases surface area to improve warmth retention.• Body-mapped design places varying insulation weights where they are most needed.• 140 g/m² weight through the body.• 100 g/m² weight through the sleeves.• 80 g/m² weight through the hood. Integrated hood hangs separately from the fleece-lined stand collar. Full-length zip with reinforced inner draft flap and zipper garage. Long sleeves with Ski Contour™ articulation. Hook-and-loop tab cuffs with inner, stretch thumbhole gaiters. Zip chest pocket. Zip hand pockets with warm, tricot pocket bags. Inner cell-phone pocket with headphone cord router. Water-resistant, Snap-Away™ powder skirt. Droptail hemline with lap front detail. Shell: 100% polyester;Lining: 100% nylon;Insulation: 100% polyester. Machine wash and tumble dry. Imported. Measurements: Length: 22 1⁄2 in Product measurements were taken using size SM (8 Big Kids). Please note that measurements may vary by size. 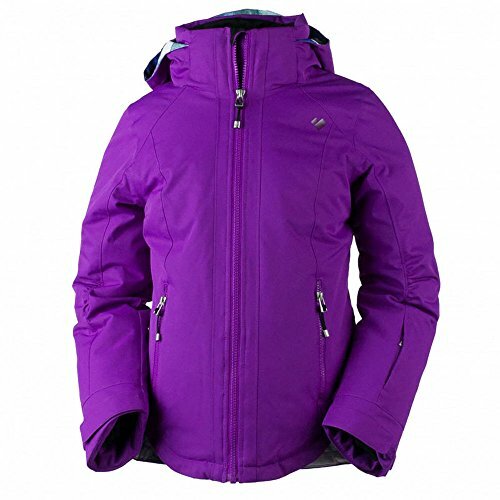 Keep off the cold and powder with the snowproof, insulated performance of the Obermeyer® Kids Kenzie Jacket. HydroBlock® Sport shell:• Micro Twill Full Dull poly-woven shell.• HydroBlock shell provides 10k waterproof / 10k breathable protection.• Skier Critical™ seam sealing tapes strategic inner seams.